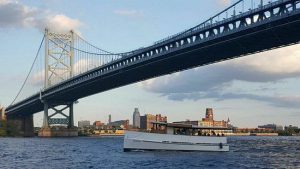 We’ll begin by travelling to Penn’s Landing and boarding a reproduction of a classic 1920’s mini commuter yacht, a U.S. Coast Guard-approved vessel. It features wrap-around seating, a fully equipped bar, restroom and a sheltered yet open stern. Our two-hour narrated cruise will take us down the Delaware and up the Schuylkill to explore 300 years of Philadelphia’s waterfront history. After disembarking at Walnut Street, our bus will take us to the Trolley Car Café for a delicious lunch overlooking the Schuylkill at the Falls Bridge. Then we’ll go back to the banks of the Schuylkill for an interpretative visit to the beautiful Fairmount Water Works, built between 1812 and 1872. Besides being the nation’s first water supply to use paddle wheels to move water, the Water Works has long been appreciated as a tourist attraction by visitors such as Charles Dickens for its pleasant design and public usefulness. It has been designated a National Historic Landmark for its architecture and engineering innovations. Cost includes transportation by school bus, entrance fees, lunch, snack and gratuities. 8:30 a.m. to approximately 4:30 p.m.